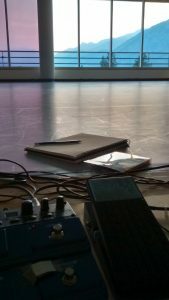 The previous blog post detailed a process for making creative music using cellphones for recording and playback. What happens when we experiment with pitch material and incorporate acoustic instruments into the mix? Ask a few students to improvise using a concert Bb scale. Keep it simple – sometimes just walking up a few notes of the scale can be quite beautiful. Record 3-5 long tones on concerts A and Bb. Playback results in a shifting semi-tone drone. Ask few brave souls to improvise using concert Bb scale. How does it sound different against a semi-tone compared to unison? Ask students to choose 3-4 pitches to record, such as A-C-E-G or D-F#-Bb. Playback. Improvise using the same notes as the recordings, and then add one note to fill in the intervals until students come up with a scale that works with the recorded pitch choices. Divide students into groups of 6-8 with the task of choosing their own pitches, recording, playback and improvising. How does a smaller group change the texture of playback and improvisation compared to larger group? What happens when you make music with the tech-y tool many people carry around in their pockets? You guessed it – this blog post is about making creative music using cellphones. I first used cellphones as a sound source to create the illusion of a forest filled with birds – many thanks to choreographer Louisa Rachedi and the dancers at the Banff Creative Gesture Lab 2017 for humouring that whim! I wanted birdcalls to come from many places and move as they would in nature, so I asked the dancers to play a pre-recorded track of birdcalls from their phones that they kept on them while they danced. I had some trouble-shooting to do (pressing play on a phone is not exactly a great dance move) but the effect was magical – the space came alive with sound with a dimensionality I usually only experience when camping. Songbird@Banff, by Louise Campbell Banff Centre Creative Gesture Lab Open House 2017. Set all phones to airplane mode to eliminate unwanted interruptions during recording and playback. Using the phone’s built in microphone and recording app, ask students to record 3-5 long tones separated by long silences. Mic sensitivity varies greatly from one phone to another, so give students time to do several takes with the phone 1 foot, 2 feet and 3 feet away to determine what sounds best. Set the track to repeat and/or turn off the advance to next track function. If neither of these options is possible, record a ten second silence after the last long tone to give the student an opportunity to stop the sound file before it advances to the next song on their playlist. Ask the students to play the recordings starting at different times. Example: Four cellphones playing the previous example track. I was going for an eerie, disembodied atmosphere to accompany a fairly disturbing scene from the play Waxworks. Repeat #4, asking students to spread out around the room in different configurations. How does it sound when students are bunched together compared to spread far apart? How does it sound when 6 phones are playing compared to 26? How does it sound when the recordings are started close to the same time, compared to started at different times over the course of 1-2 minutes? What other ways can you imagine playing this tracks?